This is an aerial photo taken of all the students and participants, forming the U.S. flag. EDINBURG – The Edinburg Consolidated Independent School District as it honors U.S. Marine Sgt. Alfredo “Freddy” Gonzalez, who became a war hero and the beloved son of Edinburg, during a special ceremony that took place at Freddy Gonzalez Elementary School. Sgt. Gonzalez was a graduate of Edinburg High School and joined the Marines right after graduation. 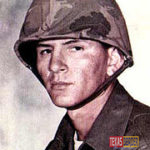 On February 4, 1968, Gonzalez destroyed an enemy bunker and fought back an enemy attack until he was killed during the Vietnam War. Sunday, February 4th, will mark the 50th anniversary of his death. His mother, Dolia Gonzalez, is scheduled to attend the event. Since his death, she has received several awards and honors on her son’s behalf, including the Medal of Honor; an Edinburg road was named after him in 1969; an Edinburg CISD school was named after him in 1975; and a warship named after him 1995. Also, scheduled to attend are the Marines from the 3rd Platoon, Alpha Company, 1stBattalion, 1st Marine Regiment that survived the Battle of Hue. Great photo opportunity: Shortly after the ceremony, there will be an aerial photo taken of all the students and participants, forming the U.S. flag. To view the Congressional Medal of Honor posthumously awarded to Sgt. Gonzalez and the exhibit which recognizes his service, visit the Museum of South Texas History in Edinburg.